If you are willing to rejuvenate your mattress, you are going to need our mattress cleaning service in Bethnal Green E2. It is the perfect tool to get the results you want. We offer more than an efficient service. It is professional and high-quality. Our workmanship is beyond compare. We have trained cleaners. Their extensive experience in this business helps them get better results and meet customers’ expectations. We are at your disposal from Monday to Sunday and we get the job done on the spot. If you have any questions, be sure to give us a call. It is important to mention that our mattress cleaning service in Bethnal Green is divided into steps. 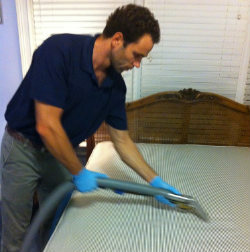 We follow a strict cleaning system that usually depends according to the type of mattress. Each and every step is accomplished with lots of care and attention to detail. We want to ensure that your items are in tip-top shape. There is no doubt our mattress cleaning service in E2 Bethnal Green will fascinate you. We would like to point out that every session is conducted on the spot. So, what happens when we arrive in your home? We will carefully inspect any stains or visible spots on the mattress and apply the right cleaning solution, which will loosen the stains. This will help us to clean the affected area to perfection. The mattress will then be steam cleaned. This will remove bad smells, bacteria, dust mites as well as the cleaning product used to dissolve the spots. Steam cleaning serves double duty by rinsing the cleaning product and sanitising the fabric. We will use the best treatment depending on the type of your mattress. You will be impressed. When we finish cleaning, you’ll be able to inspect the item. We won’t leave until you are satisfied with the results. We assure you hiring our company is the best thing you can do. We are at your service 7 days a week. If you are interested, be sure to contact us.